Population studies provide the most accurate information because they look at a large number of children who live within a specific region. 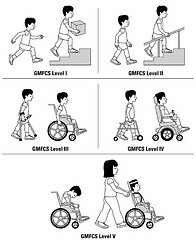 The results of these studies, in terms of walking skills, are considerably better than the impression physicians and therapists obtain by doing evaluations of the patient populations available in a cerebral palsy clinic. There is a lot of controversy and differences of opinion surrounding the subject of classification of the sub-types of cerebral palsy. This is very interesting to physicians and researchers, but has little value to the parent who only wants to know prognostic information for their child. The concept of topography is useful. If you look at the little figures in the image above, you can see shaded parts of the body. Diplegia primarily involves the legs, hemiplegia. one side of the body, and quadriplegia all four limbs. A fourth topography also exists, in preterm infants that involves both legs and one arm and is commonly called a triplegia. In these studies, severity was judged by using the GMFCS scale where Level I is mild and Level V is severe. 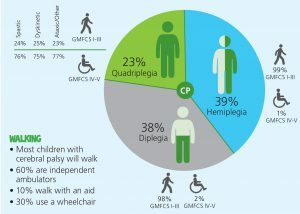 As you can see, all but 1-2% of children with hemiplegia and diplegia are walking and 23-25% of children with quadriplegia are also independent. Over 60% of children with CP walk independently and a further 10% walk with an aid. Remember that it quite often takes a toddler or young child longer than normal to become independent, but the good news is that so many do get there. My advice, if your child is not yet at the predicted stage of ambulation for his or her topography, is to sit down with your therapy team, show them the information, and ask for a plan to move your child forward. In the bad old days we did not know the data to be able to answer the question, ”Will my child walk?”. Now we do and your therapists and physicians can read the published research reviews. The citations are below. As the holiday season starts, one of the best presents for anyone with a mobility issue is a Wet Vest floatation device. (Athetosis, Choreoathetosis & Ataxia – Treat the Common Problem) You have to be strong to walk and deep water jogging is the most effective and has the highest cost benefit, combining cardiovascular exercise with reciprocal gait training. A free download is available on this site. (Basic Water Exercise Program) Make it a New Year’s resolution to get ready for the warmer weather and a summer of fun in a pool or lake. Effective rehabilitation does not have to cost a fortune. If you have already experienced the benefits of water exercise, please write in and share your stories. This post discusses the importance of timing and the quality of walking skills in the growing child. Iona Novak, PhD. Evidence-Based Diagnosis, Health Care, and Rehabilitation for Children With Cerebral Palsy. Journal of Child Neurology 2014; 29:1141 – 1156. Shevell MI, Dagenais L, Hall N. The relationship of cerebral palsy subtype and functional motor impairment: a population – based study. Dev Med Child Neurol. 2009; 51:872 – 877. ACPR Group. Australian Cerebral Palsy Register Report 2013. Sydney: Cerebral Palsy Alliance; 2013. Is TES useful for spastic cp quad ? TES can be quite helpful, especially to improve trunk function. It does not replace spasticity management, but is a useful adjunct.